If you need to pick up a passenger at the Airport, you may want to use one of the the two free Cell Phone Lots ('Passenger Pickup Lot')--stay with your vehicle until your party has gathered luggage and calls you to be picked up at the curb. To access the lot, whether you're approaching the airport using John F. Kennedy Boulevard or Will Clayton Parkway, just follow the purple signs to the entrance. No parking permitted at curbside. Passenger pickup outside of terminals, at Arrivals level: at Terminal A (TA): north side, door A113; at TB, north side door B-101; at TC: north side, door C-102; at TD: there are no arrivals - use TE, west side, door E-101 or E102. - The addition of new parking facilities at EcoPark II lot adds 2,200 spaces. Other parking options at Houston Intercontinental: Over 25,000 parking spaces offer rates ranking among the lowest in the country. All vehicles entering the A/B and TC garages will be searched by security personnel. Valet parking is now available. Parking Garages A - E: The Terminal A/B Garage is between terminals TA & TB; TC has its own garage, while TD/TE share a garage. Fees: first hr $5, second hr $6; third hr $8; 3-5 hrs $10, 5-24 hrs (daily max) $22. SurePark is ideal for frequent flyers and is a 'members only' parking program. 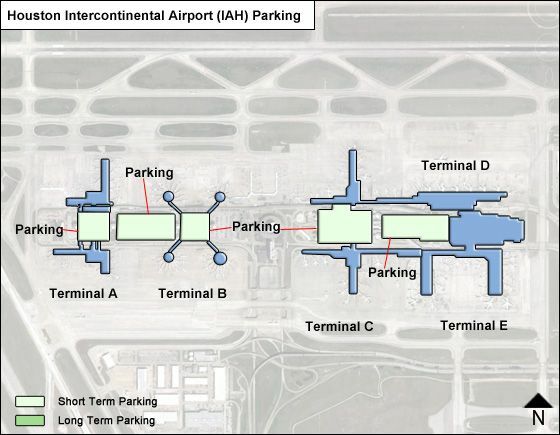 Designated parking areas are in Terminal C, level 3, C-East Garage. Fees: first 3 hrs $9; 3 to 5 hrs $12; 5-24 hrs $24. Valet parking: (tel. 281-233-3277) available at TA & TB garages on ground level; at TC garage at level 4 & at D & E garages on level 2. Fees: $13 for first 2 hrs; $26/day. Ecopark Economy Lot - with covered & uncovered parking - able to accommodate oversized vehicles - is located at the intersection of 16152 JFK Blvd. / and Greens Road (the entrance is at the north gate, off JFK Boulevard's feeder road) with free shuttle service to the terminals, which can also accommodate oversized vehicles. Fees (taxes not included): covered: first 3 hrs $4.62; 3-24 hrs $7.39; uncovered: first 3 hrs $3.70; 3-24 hrs $5.54. 'Ecopark2' on JFK Blvd. with covered spaces only is on 5021 Will Clayton Pkwy. - served by free 24/7 shuttle bus - has 2,300 covered parking spaces, EV charging stations & 30 ADA parking spaces. Campers & trucks may use the entrance off north gate (off JFK Blvd's feeder road). For more information on Ecopark2 open: www.newsouthparking-tx.com. Fees (taxes not included): first 3 hrs $2.77; 3-24 hrs. $5.54 - plus taxes. A number of off-Airport parking facilities with courtesy shuttles are also available. - InstaPark is the quickest way to park at IAH with credit card in/out service - just insert credit card at entrance, and use it again at exit. For more information call 281-233-1730. - Parking Plus is a Frequent parking program. - Automated EZ TAG to pay for parking works just like on toll roads. Obtain your TAG and display it on your windshield. For more parking information call 281-233-1730 or visit : www.newsouthparking-tx.com. Is parking free at IAH with USAF Air Medal license plates?